The Parcours des Mondes is one of the most anticipated art fairs in the world for collectors of African, Oceanic, American Indian, pre-Columbian and Asian Art. Held every September in the Saint-Germain-des-Prés neighbourhood of Paris, the fair brings together over sixty exhibitors from around the world. 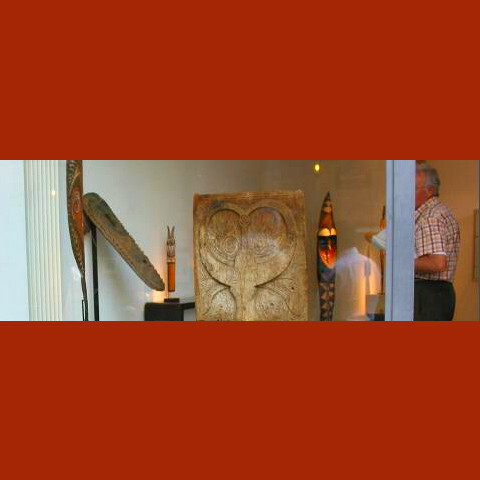 This year, with new management by TAM (Tribal Art Management), the high standard of quality that Parcours is known for will rise further still. We understand that vetting of objects for authenticity will be more rigourous than ever, so no caveats for emptors here. While the arts of Africa are prominent in this fair, it has been diversifying year by year, and now there are numerous dealers participating who show objects from Southeast Asia, our primary area of interest. Notable among them are François Coppens, Karim Grusenmeyer, Serge Schoffel, Thomas Murray and Cédric Le Dauphin. Also our friend Davide Manfredi (who is here in Bali at this very moment). The fair runs from 10 to 14 September 2008, with a preview on Tuesday 9 September starting at 4 pm. Wish I had a better picture to show here.